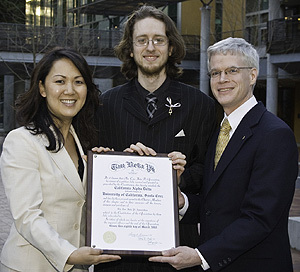 Tau Beta Pi vice president Solange Dao, UCSC undergraduate and chapter president Erik Pasternak, and professor of computer engineering Richard Hughey pose with the Tau Beta Pi charter at a ceremony marking the installation of a UCSC chapter. Photo by Matt Fitt. The Engineering Honor Society at UC Santa Cruz was officially installed as the California Alpha Delta Chapter of Tau Beta Pi in a ceremony held on Saturday, March 8, at UCSC's Baskin School of Engineering. Tau Beta Pi, founded in 1885, is the largest engineering honor association in the world, with nearly 500,000 members. The ceremony included the induction into the assocation of 20 UCSC alumni and 13 current students. The chapter was also honored to include one faculty member--Patrick Mantey, Baskin professor of computer engineering--who had not been formally inducted although he helped set up a Tau Beta Pi chapter at the University of Notre Dame as an undergraduate. Tau Beta Pi vice president Solange Dao and secretary-treasurer Jim Froula officiated at the installation of the UCSC chapter and initiation of new members. Members of many local chapters attended the ceremony and a subsequent banquet, including contingents from UC Berkeley, UC Davis, San Francisco State University, University of the Pacific, and the Bay Area Alumni Chapter. After the ceremony, visitors toured the engineering school's Undergraduate Hardware Lab, a new facility sponsored by the honor society and the UCSC chapters of the Society of Women Engineers and the Institute of Electrical and Electronics Engineers (IEEE), with funding from a $90,000 grant from Agilent. Tau Beta Pi recognizes students of distinguished scholarship and exemplary character, emphasizing integrity, excellence, and dedication to service. Only the top one-eighth of juniors and one-fifth of seniors may be considered for membership, and students must perform service projects prior to initiation. "It is both a recognition and an obligation. The dedication to giving back to the school and to society continues throughout the lifetime of membership with Tau Beta Pi," said Richard Hughey, professor of computer engineering and a faculty adviser to the honor society. Affiliation with Tau Beta Pi was a goal of UCSC's Engineering Honor Society since its formation in 2004. UCSC's petition for a campus chapter was approved last year (see earlier story). "A lot of people worked very hard for this, and it is a big honor for all of us," said chapter president Erik Pasternak. "We will, of course, continue to hold tutorials, demos, and other events on campus to encourage engineering and help teach new students." Although membership in the chapter was limited to computer-engineering and electrical-engineering majors during the petitioning process, bioengineering majors will be eligible at the next initiation, and the chapter may also petition the association's annual convention to include other majors, Hughey said. Hughey credited the past and present officers of the society for providing exceptional leadership. In particular, he singled out Pasternak and past presidents Angela Schmid, Andrew Hill, Ian Dunbar-Hall, and John Burr. "The society has been fortunate to have had exceptional officers and members," Hughey said. Note to reporters: You may contact Hughey at (831) 459-2939 or rph@soe.ucsc.edu. Contact the author at stephens@ucsc.edu.